As she begins to encounter new experiences in environments such as preschool, the dentist, the doctor, play dates, and with babysitters, we’ve calmed some of her worries with two great authors. My four year old often asks for books in which the little kids are scared and then learn to feel better. Author and illustrator Kevin Henkes and Vera Rosenberry have created entertaining, cleverly thought out, and sensitive books about anxious moments young children go through. Kevin Henkes beautifully captures his characters’ expressions in detailed illustrations, has a delightful cadence to his narrative, and often injects some subtle adult humor that your child might not notice. I love Vera Rosenberry’s illustrations of somewhat awkward looking kids and her tender way (but not overly sweet) of dealing with some difficult situations that both kids and adults encounter. Here are some of my favorite Kevin Henkes and Vera Rosenberry books. Be sure to check your local library for any of these titles. Also, your child’s school Scholastic sale probably includes the Kevin Henkes books. 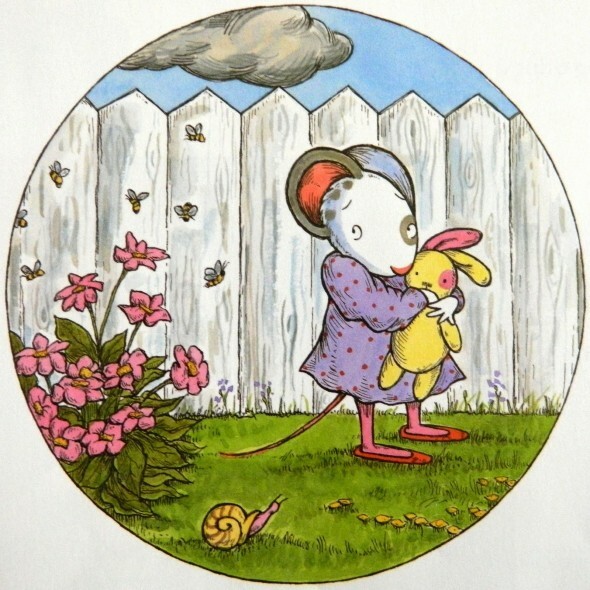 Chrysanthemum is a book about a little mouse who gets teased at school about her name: Chrysanthemum.With the help from a kind teacher, she eventually realizes that she isn’t that different after all and that sometimes being unique can feel absolutely special. Owen addresses a young mouse who has to give up his prized blanket. The blanket is his closest friend, confidant, and comforter during “nail clippings and haircuts and trips to the dentist.” But when Owen heads off to school, his Mom figures out a way for Owen to still have a piece of his loving blanket with him. A great story about separation and developing independence. “At home, Wemberly worried about the tree in the front yard, and the crack in the living room wall, and the noise the radiators made.” Wemberly Worried features a little mouse who worries all day and all night and of course, about starting school. Wemberly learns to make friends with another anxious mouse at school and how to worry a little less. Lilly’s Purple Plastic Purse is a humorous book about a free-spirited young mouse named Lilly who adores her hipster teacher. Until one day, he takes away her distracting new purple purse, sunglasses, and shiny quarters and Lilly is outraged. The book addresses ways kids can deal with frustration and anger and also how they can apologize and move on. Vera Runs Away portrays a typical busy family, one that doesn’t react as happily to Vera’s glowing report card as she had anticipated. In her mind, she thinks that everyone should stop what they are doing and celebrate her good grades. Frustrated, she runs away. They eventually find her, and Vera’s Mom says, “We’re so sorry we didn’t pay enough attention to your wonderful report card. But when you do well, you are doing well for yourself.” Pizza and togetherness ends this thoughtful story. In Vera Rides a Bike, Vera sadly loses her tricycle at the park. After a few months, her parents give her a refurbished bicycle and Vera begins to learn how to ride it. One evening when everyone is too busy to help her practice riding, Vera ventures out on her own. Unfortunately, she doesn’t know how to break yet, and ends up falling off of her bike, but makes it safely home. This is another great story about the complex path of independence, courage, and reassurance that little kids travel each day.